We’d love your help. Let us know what’s wrong with this preview of The Lost Flowers of Alice Hart by Holly Ringland. After her family suffers a tragedy when she is nine years old, Alice Hart is forced to leave her idyllic The most enchanting debut novel of 2018, this is an irresistible, deeply moving and romantic story of a young girl, daughter of an abusive father, who has to learn the hard way that she can break the patterns of the past, live on her own terms and find her own strength. To ask other readers questions about The Lost Flowers of Alice Hart, please sign up. HOW TO GET A COPY???? DESPERATE IN PORTLAND . . .
Benython Oldfield American publisher to be announced soon. I should have realised this was not the book for me when I saw reviews remarking on the similarities between it and The Language of Flowers. It seems flowers do not speak to me and sadly nor did The Lost Flowers of Alice Hart. I found the book to be over long and very disjointed. New characters were still being added with back stories in the final third of the book which I found annoying. The main character was way, way over the top. I lost count of how many times she vomited or fainted as a reac I should have realised this was not the book for me when I saw reviews remarking on the similarities between it and The Language of Flowers. It seems flowers do not speak to me and sadly nor did The Lost Flowers of Alice Hart. I found the book to be over long and very disjointed. New characters were still being added with back stories in the final third of the book which I found annoying. The main character was way, way over the top. I lost count of how many times she vomited or fainted as a reaction to stress. Normal people slam a door or have a good cry. I am not even going to start on Agnes and Alice and their abusive relationships. On the plus side there is that beautiful cover! And behind all the melodrama there was a good story trying to get out. Some of the characters, like the Flowers, were interesting and the descriptions of the Australian countryside were detailed and very effective. The Lost Flowers of Alice Hart is a rare beauty. It is one of those novels that quietly sneaks up on you and unleashes its power. I have a feeling that The Lost Flowers of Alice Hart is destined to remain by my side for some time yet. It is a fierce and assured piece of writing that makes a solid commentary on family dynamics, domestic drama and self discovery. It is a mighty feat for a new writer, but Holly Ringland demonstrates she is a force to be reckoned with. The Lost Flowers of Alice Hart revolves around the haunting but unforgettable tale of a beautiful soul named Alice. We are first introduced to a vulnerable Alice when she is nine years old. At this point in her life, Alice lives on the coast, cut off from society, at the beck and call of her overly controlling father and suppressed mother. When a tragedy strikes at the heart of Alice’s existence, she is taken into the care of her grandmother, a woman she did not know existed. Alice’s Grandmother June,whisks Alice away to her prospering flower farm. At this native flower farm, Alice meets a group of women who are also trying to heal from their own traumatic experiences. Alice eventually finds a connection and a sense of solace from the women, as well as the work on the farm. As the years go by, Alice develops a one of a kind aptitude for the native flowers she works with, this special gift highlights Alice’s unique ability to speak the special language of flowers. What Alice cannot shake from her system as she comes into her own are the lies and secrets that are linked to her family legacy. It all comes to a head when Alice is betrayed by someone close to her and she ends of fleeing the farm. In time, Alice comes to the realisation that she cannot hide behind the language of flowers and that her own story must be revealed. The Lost Flowers of Alice Hart is a metamorphic tale and one that literally took my breath away. I completely understand now why this book has been given a fair amount of hype, the attention it is receiving is completely warranted. After reading this novel, which has left a strong imprint on my heart and mind, I can understand why it was auctioned off when it initially received many publishing offers. The beauty of The Lost Flowers of Alice Hart extends the whole way through this novel. This is a novel that is as beautiful on the outside as the inside. I think The Lost Flowers of Alice Hart will take the prize for the best cover of design of the year, it does a superb job of capturing the true essence of this novel. Once you open The Lost Flowers of Alice Hart, you will be taken aback by the attractiveness of the interior of the book. Included are some of the most stunning black and white prints of native Australian flowers I have ever encountered in a novel. I know I found myself looking forward to turning each page over to see what flower design treat I was in for next. I also liked how each chapter opening was adorned with and linked to a particular native flower. Ringland is careful in her selection of each flower, as it reflects the inner struggle of the main character Alice, as her life progresses in the novel. At the same time, these chapter prefaces read like a native flora guidebook, which subtlety educates the reader in the field of native flowers. Ringland takes a vivid and full bodied approach to her characters. She strives to insert as much heart and soul as she can in her characters. I felt so much for these protagonists, both the good and the bad ones. Alice is incredible individual and I adored her engrossing journey. Following Alice over the book’s roughly twenty year period really allows the reader to get a good feel for the character of Alice. I mourned her losses, felt her achievements, fell in love with her and banged the table when she made her mistakes. Alice is such a real character that she bounces off the pages and into your heart with little effort. Ringland’s secondary character set are precise, complex in nature and well drawn. The peripheral characters, in particular the women Alice encounters in her life, reminds the audience of the true nature of friendship and loyalty. The setting in The Lost Flowers of Alice Hart is quite breathtaking and forms the lifeblood of this novel. The landscape shifts a few times in this novel, from the coast, to the rural landscape of the flower farm, to lastly the arid desert, where Alice attempts to find herself. There were many spots in the novel where the setting and the related sharpness of the prose impressed me immensely. The scenes involving Alice’s coming of age in the flower farm were by far my favourite sections of the novel. These passages were a pure delight, all my senses and emotions were in overdrive while I was reading through these scenes. Ringland clearly knows how to transport her reader to the locations of her novel with ease. There are some powerful and highly relevant themes explored in The Lost Flowers of Alice Hart, all of which are subjected to the accomplished hand of Holly Ringland. While there is heartbreaking sadness in the form of loss, domestic violence, lost love, betrayal, long held secrets, survival and trauma. On the other hand, there are themes of renewal, acceptance and self fulfillment. It takes real skill to balance the careful dichotomy between sadness and hope, but Ringland gets it just right. As a debut writer, I was blown away by her talent. I urge all readers to open their hearts and minds to The Lost Flowers of Alice Hart. It is one fiercely contemporary sojourn and an enchanting testament to Australia’s natural world, which I will not let slip from my memory. Judging from the positive reception Holly Ringland’s first novel has received, I can foresee a bright future ahead for this accomplished writer. “Most of the time he spent inside followed the awful things he did. But when he came out, he was always better. Alice had decided his shed held a transformational kind of magic, as if within its walls was an enchanted mirror, or a spinning wheel. Stunning cover and an unbeatable opening sentence, which has been widely quoted (but that won’t stop me from sharing it again. It’s terrific, especially for a debut novel. She means literally, not metaphorically, because he already managed to flare up unexpectedly at Alice and her mother without provocation. She would have been happy to set him alight. Her mother, used to his temper and abuse, always made excuses about what she should have done differently not to upset him. The author understands the situation very well and has said it comes from her own abusive background. I feel for her and for Alice. Alice’s mother has been cut off from all family, her own and her husband’s (also typical of an abusive relationship), and Alice is a lonely child with poorly patched clothes and no friends except for Oggi, the Hungarian boy at school who is bullied as much as she is. He shows her one of the first circle tricks, and it’s one that appears in later instances in other formats in the book. Both her mother and Oggi’s are keen gardeners, which I think seems to be true of many people seeking refuge in the natural world from their own which has become unnatural. At Oggi’s house, he gathered rose petals and scattered them in a circle and sat down inside it. I’m sure his mum was not as impressed as Alice was. But Alice understands flowers, having learned something of the language of flowers from her mother, and each chapter is introduced with the name of an Australian native flower and its description. Author Holly Ringland invented the language for this book, but we know Ophelia from Shakespeare’s Hamlet where she gives flowers, saying, "There’s rosemary, that’s for remembrance.” Sprigs of rosemary are used in Australia for remembrance on Anzac Day. Everyone wears a sprig of real rosemary the way people wear poppies (usually paper, I think) on Memorial (Poppy) Day. And many people say certain numbers of certain colours of roses signify certain sentiments. I think it’s a lovely concept and an interesting idea for introducing each chapter with a hint as to the meaning coming up. As for the story itself, after a family tragedy, we follow Alice through a few metamorphoses as she finds new homes and tribes, so to speak. We meet a grandmother, who lives on a rural property and runs a big flower enterprise where she looks after other “lost” women of various ages, many of whom have suffered abuse. Grandmother June shares no information with Alice but remembers (for us) her own mother and grandmother and the men who were a problem. Men mostly get pretty short shrift in this book, while women are the backbone. Although even some of them can’t be trusted, and we’re too often told they have secrets. I found far too much curling up into a weeping ball, not only by Alice but also by other women contemplating their own losses. She’s really running around in circles. This is a story of circles. Family circles that are broken, new ones that are established, stretched, reformed, circles of stars encompassing feelings too big to express, circles of petals formed as places of safety, and a giant circle of Sturt’s Desert Peas in a desert crater as a bright red Heart Garden. it sounds beautiful. Many descriptions are beautiful. I felt there were too many characters, too many stories competing for attention, and too much misery and tears. And too many secrets that didn’t need to be kept, leading to a rather abrupt ending. I think this author will find a big fan base – she’s got a lot of talent, so I’ll be keeping an eye out for her next book. Thanks to NetGalley and HarperCollins Publishers Australia for the preview copy from which I’ve quoted. Gradually Alice came to love the flowers and their The days when her father wasn’t home were the best of all for young Alice Hart. She and her mother would tend the garden together, finding a calm and peace that was never around when he was there. Alice adored her mother and was terrified of her father. But at nine years of age, a tragedy meant Alice had to live with her grandmother – a woman she had never met – on a flower farm a long way from the seaside that was the only home Alice had known. Enchanting; heartbreaking; divine! Stunning; spectacular; poignant! What a debut! The Lost Flowers of Alice Hart is all that and more, by an Australian author I’ll be keeping an eye out for from now on! Holly Ringland’s debut novel is full of depth and emotion; the story of a young girl who had to find the strength to live a life which was so different from the one she had envisioned. The cover of the book is beautiful – I was drawn to it – the beginning of each chapter with the type of Australian native flower and its meaning adds more to the story. Holly Ringland has captured the essence of Australia, and I have no hesitation in recommending The Lost Flowers of Alice Hart highly. When tragedy strikes nine year old Alice Hart is given no choice but to leave her only home she knows by the seaside and go and live with her estranged grandmother, June who was a flower farmer. Listening to her grandmother, Alice begins to learn and appreciates all the different types of flowers that her grandmother grows on her farm. Alice discovers a whole new language. Her grandmother also takes in women who have been mistreated and need a safe place to stay, hoping that she can help heal the When tragedy strikes nine year old Alice Hart is given no choice but to leave her only home she knows by the seaside and go and live with her estranged grandmother, June who was a flower farmer. Listening to her grandmother, Alice begins to learn and appreciates all the different types of flowers that her grandmother grows on her farm. Alice discovers a whole new language. Her grandmother also takes in women who have been mistreated and need a safe place to stay, hoping that she can help heal their mental and physical wounds. As the years pass Alice discovers secrets that deeply hurt her and once again the feeling of being betrayed returns and she flees from the flower farm, but she has no idea where she is headed or what lies ahead of her. This was a fabulous and very powerful story which will remain with me for a long time to come. An amazing story that sweeps you up and carries you into another world unlike any other. I loved this book and it's gorgeous cover. Highly recommended. This book not only has the most gorgeous cover but also a beautiful story of loss, love and redemption. At nine, Alice Hart is a little girl battered and bruised by her controlling, violent father, kept isolated from the world and home schooled. Her only joy is escaping into the world of books and working in the garden with her mother. When a tragedy strikes and Alice loses her parents she is sent to live on a flower farm with the grandmother she never knew she had. There she discovers not only This book not only has the most gorgeous cover but also a beautiful story of loss, love and redemption. At nine, Alice Hart is a little girl battered and bruised by her controlling, violent father, kept isolated from the world and home schooled. Her only joy is escaping into the world of books and working in the garden with her mother. When a tragedy strikes and Alice loses her parents she is sent to live on a flower farm with the grandmother she never knew she had. There she discovers not only the language of flowers but a whole new family of damaged women given refuge and purpose by her grandmother. Depois desenvolvo, tenho que sentar-me e organizar ideias, sentimentos, tudo... Mas já adivinharam... ADOREI! This was a book club pick and I must admit, I knew going in that it wasn’t my kind of book. But I was determined to give it a chance, because isn’t that what book clubs are for? The Lost Flowers of Alice Hart is like Practical Magic with flowers instead of witchcraft. Several generations of women in one family line, a big old house, a fairy tale vibe, romance, abusive men. The writing was also reminiscent of Alice Hoffman’s dreamy style – clearly Holly Ringland is strongly influenced by Hoffman’ This was a book club pick and I must admit, I knew going in that it wasn’t my kind of book. But I was determined to give it a chance, because isn’t that what book clubs are for? The Lost Flowers of Alice Hart is like Practical Magic with flowers instead of witchcraft. Several generations of women in one family line, a big old house, a fairy tale vibe, romance, abusive men. The writing was also reminiscent of Alice Hoffman’s dreamy style – clearly Holly Ringland is strongly influenced by Hoffman’s work. At times things got just too treacly for me. The workers on the flower farm – all women who have fled some sort of abuse or trauma – refer to themselves collectively as ‘The Flowers’. One of the ‘Flowers’ is a blue haired twentysomething baker of glittery cupcakes named Candy Baby (she sounds more like a Strawberry Shortcake character than a grown woman!). Granted, the whole book is not like this, and things improve when the action moves from the flower farm out into the desert, but there are enough instances that it crosses the line from sweet to sappy. Alice, the book’s protagonist, is endearing as a child but the grown-up Alice is terribly milquetoast with a tendency to swoon (she faints a few times, including once when a cute guy she’s just met takes off his sunglasses and looks at her). If only she’d been a hardier specimen, not this wilted blossom, I might have been more invested in her story. The Lost Flowers of Alice Hart is by no means a bad book, actually it is well written and achieves what it sets out to do quite well. It’s got a good heart and while it’s not really my thing I’d bet money the rest of my book club adores it. From the spellbinding cover to the very last page, I thoroughly enjoyed reading this debut novel by Holly Ringland. In the weatherboard house at the end of the lane, nine-year-old Alice Hart sat at her desk by the window and dreamed of ways to set her father on fire. It's difficult to think of a more dramatic opening line, but this is how we meet our protagonist, Alice. She's a child living an isolated life by the sea with her gentle mother, who talks to the flowers in her garden, and a violent, From the spellbinding cover to the very last page, I thoroughly enjoyed reading this debut novel by Holly Ringland. It's difficult to think of a more dramatic opening line, but this is how we meet our protagonist, Alice. She's a child living an isolated life by the sea with her gentle mother, who talks to the flowers in her garden, and a violent, jealous father who loves his wife so much she is constantly covered in bruises. When catastrophe visits the Hart family, Alice is taken inland to live with the grandmother she never knew she had, at Thornfield, a native flower farm. There Alice slowly comes to terms with her grief, and June vows not to make the same mistakes raising Alice, as she did raising her son - Alice's father. The years pass and Alice's life is seemingly enmeshed in the farm, where she has learnt the language of native flowers just like all the women in her family that came before her. Love comes and goes, but on the night of a devastating storm, when Alice finds out that she has been betrayed, she abandons her life at Thornfield and flees to the central Australian desert. There she reinvents herself as a national park ranger and begins to think she may at last have found happiness. Sometimes heartbreaking and at other times uplifting, this is a story about family, love, loss, regret and secrets. More than anything, Alice wanted to find out her own story, but it was the secrets kept by those who loved her most that prevented her from discovering who she was and where she came from. 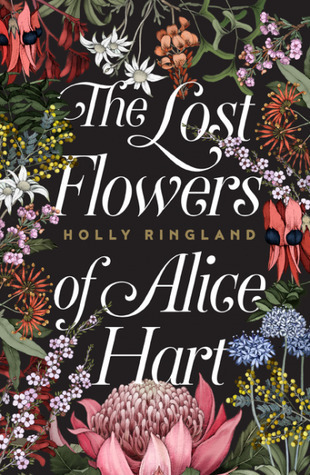 The Lost Flowers of Alice Hart is Holly Ringland's debut novel. It's been marketed quite heavily in Australia, there was a lot of excitement about it, so I had to read it to see if the hype was deserved. It's a beautifully crafted book, with not only a gorgeous cover but also each chapter has the drawing of an Australian native flower and a bit of information about it. It was very well done, so kudos to the book designers. This was a coming of age story. Alice Hart's father is a violent, volatile The Lost Flowers of Alice Hart is Holly Ringland's debut novel. It's been marketed quite heavily in Australia, there was a lot of excitement about it, so I had to read it to see if the hype was deserved. This was a coming of age story. Alice Hart's father is a violent, volatile man. When Alice was nine years old, something horrific occurs which will see Alice sent to live on a wildflower farm, with her paternal grandmother she didn't know existed. I loved the description of Thornton and the way it was run, exclusively by women, for whom Thornton was a sanctuary and a refuge. I was looking forward to getting to know more of the women on the farm. But midway through, the novel takes a different turn and sort of loses its way, pretty much like Alice. A well-written, credible coming of age story, with elements of domestic abuse, its consequences and surviving it, turns into a melodramatic mess. I can't stand it when characters/people create unnecessary dramas by not talking to each other, and in this case, it was completely over-the-top, inexplicable and incredulous. I realise it was necessary to create conflict, but I didn't buy it and I found it frustrating. There were also things that an editor should have picked. It's a contemporary novel, there's Google, still, there is letter writing happening and going to the post office to mail a letter or get the mail. Those old tropes - "I wrote you so many letters over the years" (here's a novel idea (insert sarcasm), if you really want to find someone, if you know the address, drive/fly there) or "it's not my story to tell". Honestly, the second part of the novel is a rushed jumble, which I found even more irritating since I was so taken with the first two-hundred pages. I shouldn't be so harsh, as this is a debut novel. Holly Ringland's potential is apparent so I'll be interested to read her second novel. Nem tenho palavras para descrever o turbilhão de pensamentos e sentimentos que este livro me despertou. Um livro que vai mudar a vida de qualquer um. 📚Alice o günü, hayatını geri dönülmez şekilde değiştiren gün olarak hatırlayacaktı her daim, ancak anlaması yirmi yılını alacaktı: Hayat ileriye dönük yaşanır ancak geriye dönük algılanır. Tam ortasında dururken manzarayı görmek mümkün değildir. Alice Hart’ın Kayıp Çiçekleri, ismi, kapağı ve konusuyla, çiçek seven herkesin dikkatini kolaylıkla çekecektir. Ben de içinde sevimli bir hikayeye eşlik eden, çiçekler böcekler bulacağımı düşünerek, hevesle okumaya başladım. Ama kitap hiç düşündüğüm gibi biraz hüzünlü, biraz eğlenceli bir hayat hikayesi değildi. O kadar çok gözlerimi dolduran, içimi titreten yerler vardı ki bitirdikten sonra düşüncelerim duygularım çok karışıktı. Alice’i ve genel hatlarıyla konuyu çok sevdim. Benim için kitap 3 bölümden oluşmuştu. İlk 200 sayfayı, ağlamaklı bir halde, merakla okudum. Alice’in yaşadıkları, öyle ince bir çizgide, öyle güzel bir anlatımla yazılmıştı ki etkilenmemek mümkün değildi. Yaşananlarda ağır dram havası yoktu ama yoğun bir hüzün vardı. Sürekli kalbime minik minik iğneler batıyor, gözledim dolu dolu oluyordu. Çiftlikte, Alice’le birlikte, birçok kadının geçmişinin ve yıllardır süre gelen aile mirasının, farklı kişiler açısından anlatılması çok hoştu. 3. şahıs anlatımı olsa da, bir olaya hem Alice’in açısından hem de karşısındaki kişi açısından bakmak konuyu zenginleştirmişti bana göre. Thorfiled kadınlarının 4 kuşak süren hikayelerini kısa kısa da olsa okumak hoşuma gitti. İkinci bölümde ise Alice artık 26 yaşındaydı ve hayatına yeni bir yön vermeye karar vermişti. Benim sorunum da sanırım bu bölümleydi. Çok duygusal, naif, farklı giden hikaye, sanki yazar değişmiş, kitabı yazan iki yazardan diğeri kalemi eline almış gibi değişti. Bu değişim bana göre olumlu bir yönde ilerleyemedi. Sanki ‘bir de bunu yaşatayım, bunu yaşamadan mutlu sona kavuşmasın, kaderinde bu da varmış’ der gibi bir 140 sayfa yazılmıştı. Bu bölümde her şeyin toparlanacağını, Alice’in tam anlamıyla olgunluk dönemiyle birlikte kendini bulacağını düşünmüştüm. Ama onun yerine bambaşka olaylar gelişti, işler hiç beklemediğim bir şekilde karıştı. 2. bölümde yazar, daha çok tanımak istediğim ve ‘acaba Alice için mutluluğunun, huzurunun anahtarı bu kişi olabilir mi’ diye düşündüğüm bir karakteri de bana göre çok yüzeysel yazmıştı. Son bölüm ise her şeyin bir şekilde toparlandığı ve bilmek istediklerimin büyük bir kısmının açıklandığı bölümdü ve çook kısaydı. 30 sayfada, 340 sayfa boyunca dağıttığı 20 yıllık hikayeyi, sırları, gizemleri, soruları-cevapları toplamaya çalışmıştı. Bunun sonucunda da yazar yine en sevmediğim şeyi yapmış, beni 370 sayfanın sonunda tatmin edici bir epilogtan mahrum bırakmıştı. Sanki Alice’in bundan sonraki hayatının başlangıcı, okuyucunun hayal gücüne bırakılmıştı. Bu kadar çektiği çileden sonra, dolu dolu mutlu olduğunu hissettiğim, onunla birlikte gülümsediğim bir son okumak isterdim. Aslında hiç sıkılmadan, merak ederek okudum ama kitap için akıcıydı diyemeyeceğim. Bunun en önemli nedeni ilk bölümün farklı kişilerin açılarından anlatılması ve konunun dağınık işlenmesiydi. Ama ben, farklı hikayeler ve bakış açıları içeren anlatımı sevdim, beni rahatsız etmedi. Bir diğer sebebi de kitabın çevirisiydi. Avustralya’da geçen kitapta, yerel bazı kelimeler, hitap şekilleri ya da yerel halka özgü bazı isimler kullanılmıştı ve bu kelimelerin anlamları ya da ne oldukları dip notla belirtilmemişti. Mesela en sık kullanılanlardan birisi “kakadu” kelimesiydi ve bu kelimenin Avustralya’da bir papağan türü olduğuna dair hiçbir açıklama yoktu. Bu tarz kelimeleri, okuyucunun bildiği var sayılmış ya da cümlenin işleyişinde anlaması beklenmişti. Çevirideki en büyük hatalardan bir diğeri de, June’un, Alice’in babaannesi, anneannesi ve büyükannesi olarak, farklı farklı çevrilmiş olmasıydı. Bu tarz yanlışlar ve özensiz çeviri, duygusal bölümlerde çok umursamasam da kitabın akıcılığını ciddi anlamda etkiledi. Buna rağmen orijinal kapak ve orijinal isim kullanarak, doğru bir seçim yaptığı için yayınevini ayrıca tebrik ederim. Biraz hüzünlü, biraz tahmin edilebilir ama yine de içinde değişik bir hikaye barındıran, bol bol çiçek türleri hakkında bilgi veren, daha önce hiç duymadığım kır çiçekleriyle, anlamlarıyla ve bilgileriyle dolu bir kitap okumak isteyen herkese tavsiye ederim. Apesar de ter gostado muito de ler este livro, não consigo deixar de pensar no quanto a personalidade da Alice mudou ao longo de toda a narrativa. Um livro dividido em três partes que acompanham as várias fases da vida da pequena Alice e que nos mostram como as flores são poderosas no seu significado e na sua linguagem. Alice era uma menina de nove anos que vivia com os pais num terreno à beira-mar plantado, cheio de flores coloridas, cuja linguagem era de grande importância. Desde logo que se pe Apesar de ter gostado muito de ler este livro, não consigo deixar de pensar no quanto a personalidade da Alice mudou ao longo de toda a narrativa. Um livro dividido em três partes que acompanham as várias fases da vida da pequena Alice e que nos mostram como as flores são poderosas no seu significado e na sua linguagem. Alice era uma menina de nove anos que vivia com os pais num terreno à beira-mar plantado, cheio de flores coloridas, cuja linguagem era de grande importância. Desde logo que se percebe que Alice não era completamente feliz. Ela tinha a noção de que a sua adorada mãe era vítima de maus tratos por causa do temperamento violento e descontrolado do pai e, na sua pequena mente, elaborava uma forma de fazer com que aqueles episódios violentos acabassem e a sua mãe pudesse voltar a sorrir e a ser livre. O pai de Alice era um homem de extremos. Guilt, grief, and the toxic effect of harbouring family secrets play out in this enchanting and heartfelt novel by debut Australian author, Holly Ringland. The Lost Flowers of Alice Hart is a story that orbits around wildflowers. The book itself is utterly gorgeous, from the cover through to the artwork detailed throughout. The chapters are each named for a specific wildflower/bush/grass that directly relates to the themes contained within. The meaning is given for each, along with a short descr Guilt, grief, and the toxic effect of harbouring family secrets play out in this enchanting and heartfelt novel by debut Australian author, Holly Ringland. The Lost Flowers of Alice Hart is a story that orbits around wildflowers. The book itself is utterly gorgeous, from the cover through to the artwork detailed throughout. The chapters are each named for a specific wildflower/bush/grass that directly relates to the themes contained within. The meaning is given for each, along with a short description of the characteristics. This was a delightfully unique touch that culminated in greater importance by the end of the novel. This is not a light story though and should be approached with caution if you’ve ever experienced family violence. The first 70 odd pages contain themes that may have a trigger effect for some readers. In saying this though, I will point out that Holly Ringland handled this with great sensitivity. There’s something about her writing though that really gets under your skin. It’s more in what she leaves unsaid than in any explicit renderings. The narrative sweeps along, visually appealing as well as deeply heartfelt. There were many moments throughout where I breaked from reading for reflection. Character development is strong within this novel and we get a full range of personalities and interactions. Holly Ringland brought her characters to life with such vivid realism, and consequently, I found myself developing strong feelings for many. I felt protective of Alice, right the way through. I adored Candy and Twig, the two women who brought Alice up alongside her grandmother June, but as to June herself, I pretty much loathed her and thought she was incredibly selfish. She made some questionable choices – on more than one occasion – that had a detrimental effect on Alice’s well being. I really felt that much of what Alice went through in the latter part of the novel could be attributed to June’s dishonesty. Sally was a truly beautiful woman and I’m so glad she got the opportunity to play a greater part in Alice’s life. Sally did for Alice in adulthood what June should have done for her in childhood. Lulu was a fantastic friend and it gave me a lot of joy to see Alice make such a solid female friendship, a type of relationship that had been lacking in her life up until that point. Alice is raised on an Australian wildflower farm, and her grandmother June teaches her the family tradition of speaking through flowers, something I found both beautiful and terrible all at once. Beautiful, because how lovely to be able to communicate a gesture or heartfelt moment with the right flower. Sometimes it’s hard to know what to say, we just feel too much. But on the other hand, this family had communicated every important thing through flowers for so long that they no longer knew how to simply talk about the tough stuff, leading to terrible consequences and heartache for Alice. June hid her words behind flowers and let her own selfish desires determine her actions. It affected her son, Clem, and then reached into the next generation with Alice, who had difficulty as well with communicating when she really needed to. I liked how Alice overcame this at the end and made the language of flowers bend to her own will, using them to tell her story rather than using them to avoid confronting it. I was disappointed to discover from the author notes that the setting that forms the backdrop of Alice working in the Outback was entirely made up. I understand why this is so, but the cultural history outlined and the description of the place held such a ring of truth that I was completely captivated by these parts. To find out after the fact that the place doesn’t exist was a bit of a let down. I read so much fiction inspired by fact that I’ve come to expect it with every novel now. On the flip side of this, the author details in her notes the lengths she went to in order to achieve this authenticity of setting and cultural presence, an impressive effort that certainly paid off. It may be made up, but it’s essence is grounded in truth. All in all, The Lost Flowers of Alice Hart is a deeply moving novel that will enchant, captivate, repel, and consume you all at once. I feel as though I haven’t even come close to covering all this novel contains but it is such an incredible story with so many themes and I’m loathe to delve too deep for fear of spoiling key plotlines. I’ll leave you now with my favourite scene of all, when a traumatised little girl first discovers the beauty of her new home. É-me difícil escrever algo sobre este livro. Senti as alegrias e as tristezas da Alice Hart quase como se fossem as minhas. Este livro merece todo o burburinho positivo que anda por aí em volta dele. A história é soberba. A Alice é uma força da natureza. A escrita parece quase lírica. É diferente de tudo o que li até hoje. Nota especial para a capa e o interior do livro serem lindos. O ano ainda não acabou mas será um dos favoritos de 2018. Leiam este livro, a sério. This was such an enchanting story from the beginning. I loved the voice and the setting, which created an almost magical realism style. The writing was exquisite, the child’s viewpoint poetic and lovely, even when dealing with horrors. I felt that the final third lost that magic, perhaps purposely so in echo of the main character’s own challenges. It felt to me, however, as though the style changed and the story lost its way somewhat. Still a great read, just not quite as rapturous as I’d first This was such an enchanting story from the beginning. I loved the voice and the setting, which created an almost magical realism style. The writing was exquisite, the child’s viewpoint poetic and lovely, even when dealing with horrors. I felt that the final third lost that magic, perhaps purposely so in echo of the main character’s own challenges. It felt to me, however, as though the style changed and the story lost its way somewhat. Still a great read, just not quite as rapturous as I’d first thought. If I could give this book 6 stars it still wouldn't be enough. A remarkably assured debut novel. You want a book to capture you from the very first line, and If I could give this book 6 stars it still wouldn't be enough. A remarkably assured debut novel. You want a book to capture you from the very first line, and Holly Ringland's novel does just that. It has a remarkable first line. I've read this book twice since receiving it. In the first read, I tore through the book to discover Alice's story, then immediately started again to slowly unpick the magical threads that effortlessly weave the stories of the women together. Its a book of fear, fire, friendship and flowers, but it's no fairytale and like most ancient tales, it has darkness at its heart. I had high hopes at the beginning of this book, being drawn in by the voice of 8-year-old Alice Hart, describing her horrific life under the roof of her abusive father. And I really liked the concept of plot, with the family secrets and how history repeats itself, but unfortunately I’m not on the same page as everyone else - the writing really let me down. The reoccurring themes of fire, and the language of flower just overpowered everything good about this novel; it was repetitive, spoke to me I had high hopes at the beginning of this book, being drawn in by the voice of 8-year-old Alice Hart, describing her horrific life under the roof of her abusive father. And I really liked the concept of plot, with the family secrets and how history repeats itself, but unfortunately I’m not on the same page as everyone else - the writing really let me down. The reoccurring themes of fire, and the language of flower just overpowered everything good about this novel; it was repetitive, spoke to me in riddles at times and distracted me from the plot. I felt behaviour of Alice Hart too overdramatic and forced – if someone in real life fainted that many times as Alice did I would seriously recommend a thorough medical checkup. Besides the gorgeous cover, this novel really didn’t work for me. 3.5 STARS - Disclaimer: My sincere thanks to House of Anansi Press for providing me with a complimentary copy of this title in exchange for my honest review. When I first began this debut novel by Australian author Holly Ringland, its eye-catching cover and its engaging beginning impressed me immediately. Filled with family tragedy and a young heroine readers could get behind, I quickly understood why this book was such a hit in Australia. Throughout the book there are beautiful sketches of flow 3.5 STARS - Disclaimer: My sincere thanks to House of Anansi Press for providing me with a complimentary copy of this title in exchange for my honest review. Throughout the book there are beautiful sketches of flowers native to Australia as well as tidbits of info on them that some readers will enjoy. The book has three distinct parts and I was most riveted with the first third of the book as we witness Alice's tumultuous and often abusive childhood. The second part is filled with her new life on a flower farm with her grandmother and a bunch of lost souls where she learns more about her parents' early relationship. Many characters are introduced, some just pop in and others we're given a brief background, but there were some (specifically, Twig, Candy Baby and June) whose contribution to the story felt too brief. Unfortunately, I found the last third of the book to be weak. It strayed too far from the feeling of the first two-thirds of the book and had a distinctly overly melodramatic feel. More characters are introduced (oh how I wish Moss had a bigger role!) and Alice became someone I almost didn't recognize; she was irritating, immature and made obviously bad decisions. Unfortunately, this part of the story did not grip me as the earlier parts of the book and I found the ending to be predictable. A Alice desta história é minha amiga. Conheço-a desde tenra idade. Conheço como adora livros, como os conheceu através da mãe e das histórias da mãe. Como os conheceu quando um dia irrompeu na sua camisa de noite, na biblioteca ao pé de sua casa. Alice. A Alice adora flores. Adora flores porque a mãe adorava flores e lhe ensinou o carinho por elas, o carinho pelo jardim, a linguagem das flores e as histórias que elas contam. Conheço Alice desde tenra idade até à sua adolescência, ao seu pri Alice. Assim como sinto o carinho das... Flores. Que amiguinhos. Sempre amigos. Sempre os companheiros... são eles os patudinhos desta história. Foi com eles que ri, me indignei e me emocionei... também. A pessoa que nas sombras desata nós mal feitos e os tenta de novo amarrar mas desta vez, atando-os para sempre e atando-os com amor, serenidade, compaixão e amizade. Julgo que são livros como este que fazem as pessoas apaixonarem-se pelos livros! Há muito tempo que não encontrava um livro tão bom, que me deliciasse da forma como este o fez! Tudo nele é bom: a história, a associação às flores, a escrita da autora (ainda mais louvável sabendo que é a sua primeira obra), a capa maravilhosa, o interior igualmente bonito e único. Fiquei encantada com esta leitura e dei por mim a ler muito devagar (o que não é meu costume), a saborear cada frase e aproveitar o livro ao máximo. Foi uma experiência de leitura fantástica. O livro é grande, mas não teve momentos mornos, manteve sempre a minha atenção e fez-me apaixonar por esta personagem tão peculiar quanto forte, Alice Hart. Gostei muito deste livro, só tive pena do final... penso que ficaram algumas coisas no ar! It didn’t take me long to appreciate why Alice might want to set her father on fire: Clem Hart is an abusive, violent man who controls Alice and her mother Agnes. When tragedy strikes the Hart family, Alice is sent to live with her paternal grandmother: June. Because Clem was estranged from his mother, Alice did not know her. Imagine: a nine-year-old child, having to move away from the place she knew as home, to live with a grandmother she did not know existed. I kept reading. June Hart farms Australian native flowers, with the help of a group of women known as the Flowers. Each of the Flowers has her own story, and we’ll learn some of them. It’s a supportive environment for Alice, who grows to adulthood learning about the language of flowers. There’s a future for Alice, if she wants it, running the farm. But life is complicated, and Alice leaves the farm and makes her way into the central Australian desert. Will she find what she’s looking for? Is it a place she needs, or simply the time and space to remember? Each chapter is linked to a native flower, each flower is significant in Alice’s journey. I’d like to write more about the story, but my descriptions and interpretations could well spoil a first time read. I found it difficult to put this book down and yet I had to sometimes in order to try to integrate what I’d read. I wanted Alice (and June) to make different choices at times: I wanted the road to be less tortuous, the choices to be simpler. I wanted Alice not to have to repeat mistakes to learn from them. In short, Alice got under my skin in a way that few fictional characters do. I finished the novel wanting more, but confident that Alice had found her own way. This is Ms Ringland’s first novel: I hope it is the first of many. Note: My thanks to NetGalley and HarperCollins Australia for providing me with a free electronic copy of this book for review purposes. The cover and internal illustrations by Edith Rewa Barrett are beautiful and I’ll be buying my own copy of this novel. This is one of the most anticipated and exceptionally well marketed books of 2018 (there was even a bidding war over the manuscript!) with a gorgeous author to boot. Despite the confronting and ugly theme of domestic violence within, this book is FULL of beauty: the magnificent cover design, the flower artwork throughout, the extensive descriptions of Australian native flowers and our unique landscape, the chapter names & themes & dreamy font, and of course, the ‘language of flowers’ its This is one of the most anticipated and exceptionally well marketed books of 2018 (there was even a bidding war over the manuscript!) with a gorgeous author to boot. Despite the confronting and ugly theme of domestic violence within, this book is FULL of beauty: the magnificent cover design, the flower artwork throughout, the extensive descriptions of Australian native flowers and our unique landscape, the chapter names & themes & dreamy font, and of course, the ‘language of flowers’ itself. Holly brings a deeply personal understanding of domestic violence to her novel. I imagine this will be tough going for some readers. She has also filled the novel with all her favourite things, and her passion for native flowers and sweeping landscapes and fairytales is so evident. I love it when a writer brings so much of their own self to a novel. I do wish the story itself was longer though - I often felt ‘rushed on’ and wanted more time to actually invest in Alice. If I’m truly honest - the story was overshadowed, for me, by the novelty of the concept and all the artwork and many flower language references. I am very lucky to work in the publishing industry so was able to read this book in proof form last year. It is such a special book with the most beautiful writing and characters that you fall in love with, who linger in your thoughts long after you put the book down. At times I was challenged by the lead character's choices she made, as you care so much about her (and that is what makes it so special ) and you want the best for them, but that is what makes this novel so real - we all make mistak I am very lucky to work in the publishing industry so was able to read this book in proof form last year. It is such a special book with the most beautiful writing and characters that you fall in love with, who linger in your thoughts long after you put the book down. At times I was challenged by the lead character's choices she made, as you care so much about her (and that is what makes it so special ) and you want the best for them, but that is what makes this novel so real - we all make mistakes and sometimes repeat patterns good and bad, I really did not want this novel to end. Neem een treurig boek zoals Het einde van de eenzaamheid, doe daar een scheut Lori Nelson Spielman bij qua hoe ze over vrouwen en familiebanden kan schrijven, en je krijgt dit. Het verhaal verzwolg me helemaal en ik wilde niets anders doen dan meer en door en uit, maar ik wilde ook niet dat het uit was. Want het is zo mooi en zo bijzonder en zo fijn, ondanks de eigenlijk enorme treurigheid van dit verhaal. Wat is enorm fijn vindt aan dit boek is dat het chronologisch verteld Wauw, wat een verhaal. Wat is enorm fijn vindt aan dit boek is dat het chronologisch verteld wordt. Geen alwetende verteller of forshadowing, je groeit echt met Alice mee op. Ik vroeg me steeds af wat bepaalde gebeurtenissen voor effect zouden heb op Alice als ze opgroeit. Wat voor persoon ze zou worden. Je ziet haar keuzes maken waarvan je soms denkt ach meisje toch, maar het is wel mooi om te zien hoe Alice haar eigen weg zoekt in de wereld. Daarnaast is de schrijfster supergoed in niet alleen verhaallijnen aan elkaar knopen, maar echt met elkaar verweven met mooie details. En ook een verhaallijn met zichzelf, het is zo mooi hoe bepaalde details of patronen zich herhalen. Het voelt echt als een bijzondere biografie. En oh wat zat er een brok in mijn keel bij de laatste pagina's. Echt een heel bijzonder verhaal - ik val in herhaling. HOLLY RINGLAND grew up barefoot and wild in her mother's tropical garden on the east coast of Australia. Her interest in cultures and stories was sparked by a two-year journey her family took in North America when she was nine years old, living in a camper van and travelling from one national park to another. In her twenties, Holly worked for four years in a remote Indigenous community in the cent HOLLY RINGLAND grew up barefoot and wild in her mother's tropical garden on the east coast of Australia. Her interest in cultures and stories was sparked by a two-year journey her family took in North America when she was nine years old, living in a camper van and travelling from one national park to another. In her twenties, Holly worked for four years in a remote Indigenous community in the central Australian desert. Moving to England in 2009, Holly obtained her MA in Creative Writing from the University of Manchester. Her essays and short fiction have been published in various anthologies and literary journals. She now lives between the UK and Australia. To any question ever asked of Holly about growing up, writing has always been the answer.